Tokumei Sentai Gobuster Cast Rumors: Round 1, Olympics! Hey, the newest set of cast rumors have popped up, and it looks like one of the possible color combinations will be that of the Olympic Rings, a Red-Blue-Yellow-Green-Black color scheme as with Liveman or Go-Onger. Who are any of these people? I have no idea. So far it’s been rumored that the team will start off with three members, Red, Yellow and Black, diverging from the standard norm of starting with a Blue senshi. And even more so, it’s rumored that this Black senshi will be female (regardless of whether or not the person pictured above is chosen), making her the first Black senshi in Super Sentai history! Well, if any of this is true, then we’ll definitely be headed into a period of team make-up experimentation. Of course, this is just a rumor for now, most likely we’ll go through several color schemes and potential casts before we ever get any form of confirmation. But this would still be an interesting direction to take. Author M.F. CalhounPosted on October 26, 2011 October 26, 2011 Categories MC's postsTags cast, color scheme, Go-Onger, Kabumoto Hideaki, Liveman, Miyashita Maika, Nagashima Kenjiro, Olympic Rings, rumors, Takei Shun, Tokumei Sentai Gobuster, Tomita MayuLeave a comment on Tokumei Sentai Gobuster Cast Rumors: Round 1, Olympics! Go-Kaiger Ep.29 Raw and Ep.30 preview: Abare Live! Author M.F. CalhounPosted on September 11, 2011 September 11, 2011 Categories MC's postsTags Abaranger, episode 29, episode 30, Kaizoku Sentai Go-kaiger, Liveman, preview, raw, sub, subbed, tribute episode, videoLeave a comment on Go-Kaiger Ep.29 Raw and Ep.30 preview: Abare Live! Go-Kaiger Ep.29 screen shots and video clip: Mysterious Pink RangerKey and Rampaging Pirates! Well, that’s it for Go-Kaiger news at the moment, sorry, no videos yet. If I find anything else, I’ll let you know. Author M.F. CalhounPosted on September 11, 2011 September 11, 2011 Categories MC's postsTags Abaranger, clip, episode 29, episode 30, GoJyuGo-KaiOh, Kaizoku Sentai Go-kaiger, Liveman, preview, screen shots, tribute episodeLeave a comment on Go-Kaiger Ep.29 screen shots and video clip: Mysterious Pink RangerKey and Rampaging Pirates! Go-Kaiger Episode Summaries: And now we’re up to FOUR Tribute Episodes for Spetember! Gai helps the Pirates to interpret Navi’s prediction. Accordingly, they start searching for Jetman, when a man on a motorcycle appears before them and steals Joe’s Mobirates. The man is Black Condor, and he tells them to stop looking for Jetman! Just what is he after!? The former AbareBlue of AbaRanger, Yukito Sanjou (Shou Tomita), appears with his wife and secretary, Emiri Sanjou (Michi Nishijima), the self-proclaimed “former AbarePink.” Ahim transforms seven times, could one of these changes be….AbarePink?!! Action Commander Daiyaru appears. This episode was also noted to feature Ahim and Gai pretending to be a couple. This is also believed to be the episode where they will fully unlock Abaranger‘s Grand Power to form GoJyuGo-KaiOh. Liveman’s former Yellow, Joh Ohara (Kazuhiko Nishimura), appears before Joe, who has acquired Barizorg’s blueprints. Together, they head for Academia to try to find a way to turn Barizorg back into a human! Great Scientist Zaien will be this episode’s villain. OhRanger’s former OhRed, Gorou Hoshino (Masaru Shishido), tries to get in contact with Basco, while OhPink, Momo Maruo (Tamao Satou), gets in contact with Gokaiger!? So, to sum up the summaries, we’ve got tribute episodes for: Jetman, Abaranger, Liveman, and Ohranger. And I thought my schedule was going to be busy next month. Author M.F. CalhounPosted on August 30, 2011 Categories MC's postsTags Abaranger, episode summaries, episodes 28-31, Jetman, Kaizoku Sentai Go-kaiger, Liveman, Ohranger, September, tribute episodeLeave a comment on Go-Kaiger Episode Summaries: And now we’re up to FOUR Tribute Episodes for Spetember! Looks like September’s going to be a busy month for the Go-Kaigers, we already have confirmation for three tribute episodes next month, the first of which will be the Jetman tribute episode. While we don’t have episode summaries for all of these episodes yet, we do have the first two episodes for the month of September. So let’s see what going on next month! An Action Commander by the name of Kiaido shows up to try and collect the bounty on the Gokaiger as they begin their search for the Jetman. Marvelous gets beaten by Kiaido and in his retreat runs across a strange man called Gai, otherwise known as a former member of the Jetman. Action Commander D’ailleurs is the threat this time. As D’ailleurs can feed off of the energy created by happiness, Ahim and Gai attempt to lure him out by pretending to be a couple madly in love with each other. 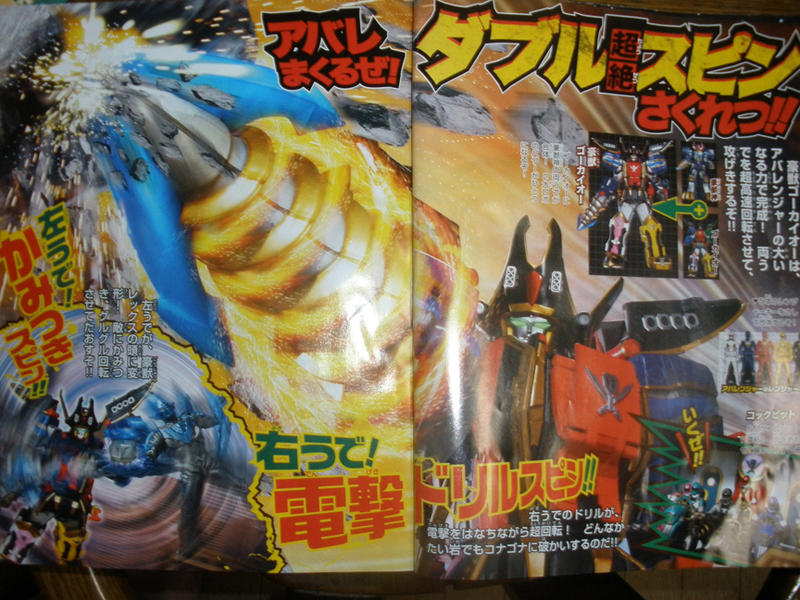 This is a leaked scan of Yuuki Gai (Black Condor of Jetman), shown here with a mobirate(? ), which official confirms that he will appear in the Jetman tribute episode sometime in September. The actor, Wakamatsu Toshihide, confirmed this several weeks ago from his blog. He is among a growing list of confirmed returning actors, which includes Nishimura Kazuhiko (Ohara Jo/Yellow Lion of Liveman), and according to some rumors, both AbareBlue and AbareYellow! Author M.F. CalhounPosted on August 23, 2011 August 23, 2011 Categories MC's postsTags Abaranger, AbareBlue, AbareYellow, Black Condor, confirmation, Jetman, Kaizoku Sentai Go-kaiger, leak, Liveman, news, Nishimura Kazuhiko, Ohara Jo, REAL PICS, rumors, scans, tribute episode, Wakamatsu Toshihide, Yellow Lion, Yuki GaiLeave a comment on Black Condor has returned! Joh Ohara/Yellow Lion to return in Go-Kaiger: Liveman Alive! Nishimura Kazuhiko, who played Ohara Joh/Yellow Lion in Choujuu Sentai Liveman, is confirmed to reprise his role on Kaizoku Sentai Go-Kaiger in the Liveman tribute episode! The confirmation came from Nishimura’s own blog, where he mentioned that wardrobe was fitting him for the show, possibly to recreate his character’s “Miami Vice-style” outfit. The Liveman tribute episode will be directed by Watanabe Katsuya. This is the second confirmation of a pre-Zyuranger sentai tribute episode being made, the first of course being Wakamatsu Toshihide’s confirmation that he would return in the Jetman tribute episode. Author M.F. CalhounPosted on August 6, 2011 August 6, 2011 Categories MC's postsTags announcement, Kaizoku Sentai Go-kaiger, Liveman, news, Nishimura Kazuhiko, rumors, tribute episode, Yellow Lion1 Comment on Joh Ohara/Yellow Lion to return in Go-Kaiger: Liveman Alive! Now I know what your thinking from the title, “Holy Crap! What kind of show are they making?”, but calm down, it’s not that kind of gender reassignment. Although now that you mention it, who are you to judge?! But seriously, no, it’s not that at all. This has more to do with the speculation over how many members Go-Kaiger will end up with. You see, when the rumors about Go-Kaiger started popping up, a good deal of them dealt with the possibility that there may be more than one senshi with the same color, like say, a male and female yellow, or a male and female blue. Other rumors included the possibility that there would be a number of extra senshi that would have a wide spectrum of colors in order to fill the color gap, such as the Go-KaiBlack rumors. But, according to recently released photos and screenshots, it seems that neither of these rumors were ever true. There are two main sources that put the final nails in the coffin for these rumors. The first is the released footage from the Goseiger Vs. Shinkenger movie, that shows the entire squadron changing into red senshi from the previous five seasons. That’s a huge indicator that show that clearly any one of them can turn into any previous senshi. The second source comes from a magazine (publication unknown to myself)that has both a two-page spread where each of the senshi are surround by all the previous senshi they will change into in the show AND a foldout poster that feature them in the center and images of the team changed into previous teams organized around the poster. And let me put it this way, there are a number of them who are wearing skirts now that weren’t before, and there are even a couple missing skirts. Well, here’s the skinny of how the teams will be worked out. Basically, all past yellow senshi are now female, all past blue are male, and Go-KaiGreen will mostly be changing back-and-forth between green and black. Now it’s not completely strict to that. Go-KaiPink, for example, will change into Black Bison from Liveman, KuwagataRaijer, GekiChopper, and Go-OnBlack. Go-KaiYellow will also take the role of Big One from JAKQ, and ChangeMermaid. And Go-KaiGreen will also change into KabutoRaijer. And in two cases the full team isn’t there. SunVulcan only has three senshi, and Abaranger doesn’t include AbareKiller. The only real consistency is that, at least on that poster, red is always male. But considering the possibility that any of them could be any one of those past senshi, who knows what could happen! But, at the end of the day, who can really say for certain what will happen, and who cares? As long as they do a decent job with it, and they’re able to get past the problems that have shown up in other series that have done the same thing already (although I would like to say that I liked Kamen Rider Decade, even if some people absolutely hated it). And besides, when they’re not past senshi, they’re pirates, and pirates are always cool, mostly.